It takes something remarkable to stop New York City commuters in their tracks, and on Feb. 12, Chobani was the one bringing travelers to a halt. 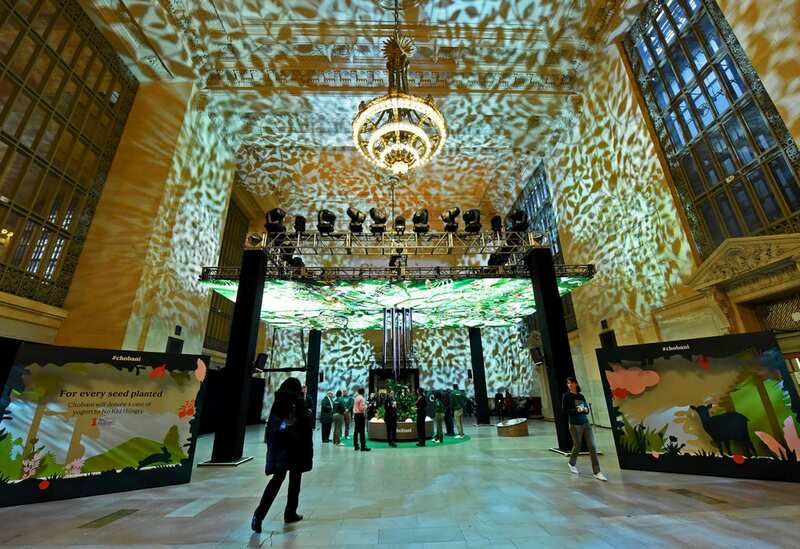 To promote its 10th anniversary, the Greek yogurt brand installed a digital fruit tree in the center of Grand Central Terminal’s Vanderbilt Hall, where consumers were invited to interact with the installation by “planting” virtual seeds, each of which corresponded to a popular Chobani SKU. The activation served as a live representation of the brand’s “One For All” anniversary campaign, which centers on giving and generosity. To that end, for each virtual seed planted, Chobani donated a case of yogurt to No Kid Hungry, a campaign dedicated to ending childhood hunger in America. The name of the installation: The Giving Tree—a nod to Shel Silverstein’s classic children’s book of the same name. The experience began just below the “trunk” of the tree in a mini garden display featuring colorful orbs. Overseen by a crew of employees who took on the role of brand ambassadors, the experience began just below the “trunk” of the tree (created from LED strips) in a mini garden display featuring colorful “orbs.” In order to plant a virtual seed, participants placed their hands on one of the orbs, which, when touched, triggered pressure sensors that caused it to pulsate with light energy. When the individual removed their hand, effectively planting the seed, it set off a digital fireworks display of sorts in the tree canopy above featuring images of bursting fruit and sound that reacted to the animations. In addition to the tree installation, the campaign includes a massive product giveaway through March 4 aimed at rewarding loyal fans and enticing those who have never tried Greek yogurt, which adds up to around 50 percent of the country. 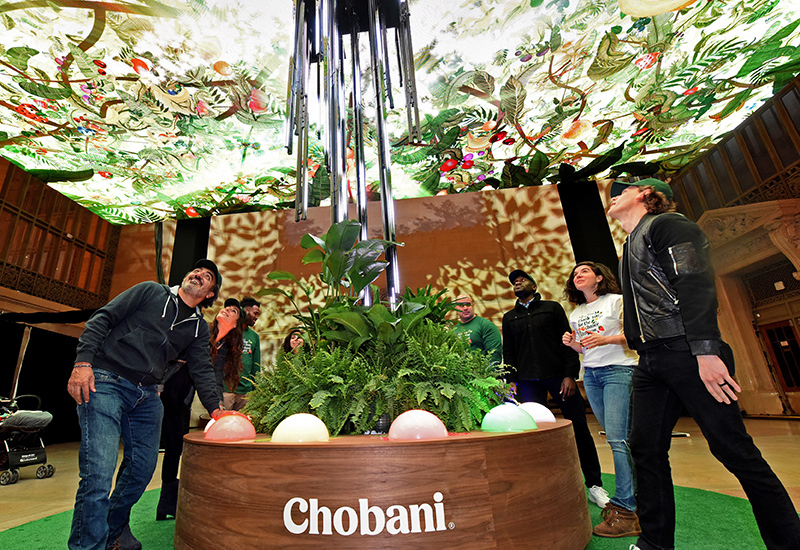 “The purpose of this activation was to kick off the One For All campaign,” says Leland Maschmeyer, chief creative officer at Chobani. “So we wanted to simply create an installation that had a big bang and embodied what the whole campaign was about, which was generosity… This was an opportunity to bring some delight, some excitement and a bit of magic to [the campaign].” Agency: HUSH, New York City.